This is how I, and one suspects many, learned the Moeran Concerto. Georgiadis and Handley trod a sweetly affectionate path balancing reticence and folkloric dynamism whilst exercising fine judgement. The LSO was on excellent form for its soloist-leader providing him with vibrant and well balanced support. Handley’s shaping of cantilena is often magical and Georgiadis explores the crest of the work’s lyrical and furtive heart with considerable sensitivity. He is noticeably successful at heart-stopping pianissimos and at his deft interplay with orchestral principals. Handley too, abetted by the Lyrita engineering team, brings out the bold bass writing and those moments of percussion dash. It all adds up to a distinctive and distinguished reading, one that still excites admiration. Of course things have changed in the Moeran discography. We may now never get to hear Arthur Catterall in the work but we can hear Sammons on Symposium. Catterall would almost certainly have played it with a certain classicist restraint though without hearing it this must remain moot. Sammons offers a master class in romanticist credentials – swift ones too as was ever the way with him – and in Boult he had an accompanist tactician of the highest class. The recent appearance of the Campoli on Divine Art, again with Boult has taken most of us by surprise. This dramatic rendering is a must-hear though very different from, and stylistically inferior to, the 1946 Sammons. In its time the Georgiadis was rather eclipsed by the next commercial recording by Handley again, this time with Lydia Mordkovich taking soloistic honours. Along the way performances on radio or concert or both have included one by Tasmin Little, whose Elgar concerto performance, incidentally, should have been recorded by now. Beautifully shaped though the Georgiadis/Handley is it does cement the work rather too rhapsodically. The qualities of tensility and biting drama that Sammons found are not really to be found in the Lyrita, which is altogether a more clement reading. The soloist’s tone, firmly focused and of concentrated sweetness, is also not quite the vehicle to blossom and bloom with radiance. Certain colours are therefore missed. The Violin Concerto was originally issued without any coupling. It’s now been joined by two of the Rhapsodies. The Rhapsody No.2 is an especially distinctive and attractive piece, full of youthful fire, revised seventeen years after its composition. 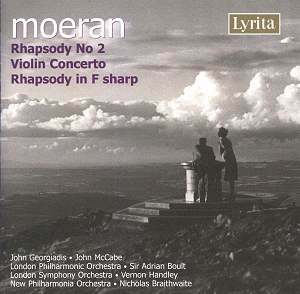 Two years later Moeran finished the Third Rhapsody, in which John McCabe once more reveals his credentials as an ardent champion of the native muse. As with the Violin Concerto the Lyrita Rhapsodies have been better known in the Chandos inscriptions and mighty fine they are. But it’s been highly instructive to hear Handley’s mentor, Boult – hero of the off-air Violin Concerto performances - reprise his eloquence in No.2 and also to hear that ferreter out of obscure things, Nicholas Braithwaite, do similarly with the later work. Clever programming ensures this is a very viable contender. Of the commercially recorded Concerto twosome Mordkovich’s is the more ardent performance; in the case of the off-air survivors Campoli plays it like Bruch (not such a bad idea) and Sammons plays it better than even Moeran can have hoped.